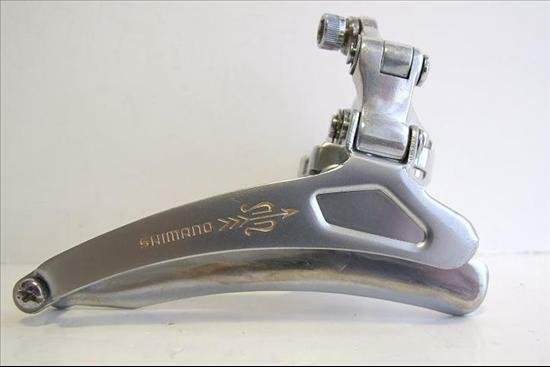 First Generation Shimano 105 front derailleur. This group is commonly known as the Golden Arrow group. Usually paired with the crankset from the group which was equipped with a 52/42 chainring set. Should have no problem handling 38-52 jumps. Trap-Ease Mechanism, Indent Guide Mechanism, Golden Arrow Pattern. Also available in a triple version (rare?) model number FD-T105.